A few weeks ago, Fringe zipped forward to the year 2036 and showed us a world ruled by The Observers, time traveling super-powered bald men from the 27th century with a passion for fedoras, hot sauce and flasks of ice water. Can Walter (John Noble), Olivia (Anna Torv), and Peter (Josh Jackson) do anything here in the present to avert this fate? If you’ve seen the season four finale, then you now know – SPOILER ALERT! – that you’ll have to wait until the cult fave’s fifth and final season for the answer. “That’s certainly the suggestion at the end,” says exec producer J.H. Wyman, referring to two revelations in the closing moments that would seem to pave the way for Observageddon. “The idea that September says ‘They’re coming’ and that Olivia says she’s pregnant really does set us up for what we saw in ‘Letters of Transit.’ At the same time, I will also say that everything you’ve seen over the past four seasons is hugely important to season five. Pinkner and Wyman also say they wanted to use season four’s last act to clear some decks – shutting down the bridge linking the parallel worlds; killing off recurring villain David Robert Jones (Jared Harris, bound to Mad Men and more movies ) – so the swan song season would be free to focus on “other matters.” Will season five take place in the present, or will the series spend more time in Observer-controlled 2036? The producers declined to answer, though Wyman noted that they would adhere to their policy of only jumping around in time if and when the story demands it. I still say this all goes back to the manifesto(s) and <i>First People(s)</i> White Tulips = knowledge passed from time line to time line, with the origins becoming lost. Thanks for posting this Darth! Nice to see a little bit of info for the season 5 episodes. It does sound like the Red universe has been finished off imo. It's too bad that we won't get Lincoln Lee anymore if that is the case. I actually got to like his Red character and especially this years Blue L.L. But I suppose everything is going to be trimmed down and focused on finishing up the show in 13 episodes. I get the feeling that the William Bell we saw in the finale was a true time traveler that discovered how to bounce around in time just as The Observers do now. He has been picking up lots and lots of info which he decided to use for his own purposes. Our original W.B. seemed to be stuck in the Red universe after those times he did cross over and back, which resulted in his poor health. Looks like this W.B. did basically the same thing but this time around he seems to be jumping ahead/backwards(?) in Our time line instead, and that too resulted in his health being affected badly. I still don't know what his ties will be to The Observers but I can't help wondering why he was trapped in the amber with the team if he was "working" with The Observers all this time. Maybe he discovered them and that is why he wrote the ZFT manuscript in the first place believing that he would be able to stop what he "already" saw happen in the future. JacobsMom wrote: Thanks for posting this Darth! Nice to see a little bit of info for the season 5 episodes. But clearly Bell's season 1 manifesto, first people connection (which is multiples versions of themselves in multiple futures of multiple time lines), his devices (Nina's arm, The Machine(s), Nanites, Shapeshifters, guns, ect) and his company/companies (Massive Dynamics/Kelvin Genetics) point to just how knowledgeable he is, which is why I sense that he (and probably Walter) were the root cause leading in the Observers own creation. Yeah I found it! -It's from when they interviewed J.J. Abrams after Fringe's season 5 pick up! So who knows what else they have up their sleeves! Seth Gabel will not be back as a series regular. In a recent interview with TVLine, Fringe‘s leading lady, Anna Torv, noted that the odds of Gabel returning were slim. “I don’t think [we'll see Lincoln again],” she lamented. “Unless we go to the other side, no” — a prospect made less likely by the season-ending closing of the bridge between the two worlds. A Fringe insider, however, isn’t ruling out a guest appearance or two by Gabel during the final 13 episodes. Well not too surprising, but I do suspect we will see the red universe close to the end, if not the end of the series. So is 2036 going to be part of the show's fifth and final season? It's certainly looking that way, as, according to SFX Magazine, executive producer JH Wyman has said, "Yeah, I think it's safe to say you will [see that]. Part of our storytelling is about reveals and re-contextualizing what you think you know and what you've seen and putting it in a different mind frame for the viewer. It's good to say that future is important to our storytelling but it's not the be-all and end-all. The critical question is always why do we do flashbacks or flash-forwards and for us there is always a reason. Does 'Letters Of Transit' have further implications? It does. You need to understand what it is, or was, in order to fully grasp the thematic things we want to tell this year." It's possible that LOT was the upcoming future, but September (and maybe by extension that future's characters) are/have been trying to change it again (we can argue that September was responsible for both Peter's existence and also knowledge about the machine(s) --He gave Olivia the first half of the prophecy page, which sets up a chain reaction including the existence of Henry and then, allegedly his counter existence (at least as far as Peter is concerned right now). As far as William Bell and perhaps other time travelers are concerned, I have to think there is a war going on. Boy thinking about this another way...then we say the 2036's characters are "past-current" characters and the 2012-2015 characters are "current-future" characters....What I wonder is what will happen to them...will they have to kill themselves, or will that naturally happen, or will there be a convergence? Or will the 2012-ers dies off and then the 2036-ers go back, or will there just be two happy futures that exist @ 30 years apart??? Anna Torv Interview: Thoughts on Season 5! Looking to Fringe‘s final, 13-episode season, Torv confirms that Season 4′s Episode 19 – in which she did not appear (thus affording her a chance to hang with her visiting mum in Vancouver) – will inform what’s to come. Though she has not yet been made privy to how much of a time jump will occur between seasons, she’s confident that, save for maybe flashbacks, we won’t see Olivia pregnant. But other than that, “I’m not sure where Olivia is,” given her eventual and rather conspicuous MIA status in the year 2036. Such a scenario presents, however, an “age”-old problem. And Torv knows it, yet has a fix for it. “People are like, ‘But what about you aging?’ And I’m like, ‘She’s been on cortexiphan!’ Then I would be able to work with Georgina [Haig, Etta]” – if the other Australian actress comes back. I am still suspicious about the time line itself, but despite that I am really looking forward to season 5 and how it renders some of these things. In the Season 4 Fringe episode “Letters of Transit,” which was set in the year 2036, Peter says that he, Walter et al had been trapped in amber for some 20 years. So it would stand to reason that if the Fox drama’s final season jumps ahead in time, it would be either by a little… or a lot. The answer, to hear John Noble tell it, is the latter. “As far as I know, we’re just jumping ahead [to 2036],” Noble shared with TVLine at the Critics’ Choice Awards on Monday, where he was nominated for Supporting Actor in a Drama (the prize he took home a year ago). While some Fringe fans my lament the decades’ worth of “lost” time, Noble allows that “there will be references” to the team’s pre-amber days, even using “found footage” to share monumental moments with viewers. Yes, you read the above correctly: Though Olivia (played by Anna Torv) was conspicuously MIA from the “Letters of Transit” episode that informs Season 5, “She’ll be back” in this return to the future, Noble reassures. Viewers can also expect to once again see Olivia and Peter’s grown daughter Etta (played by Aussie actress Georgina Haig). Meaning that just as your eyes welled up upon witnessing Peter meet adult Etta (watch clip below, because you know you want to), Noble foresees “a wonderful reunion of mother and daughter” — a scene, he tells us, Torv is “really excited” to play. Noble himself, meanwhile, is excited to “tie up the loose ends and emotional connections” that Fringe has put forth over five seasons. Episode 5x01 Title: ""Transilence Thought Unifier Model-11"
Oh boy...in other words, all that rises must converge and follow the leader! Have we all seen the first S5 promo poster, released at ComicCon? Pretty cool. Sorry it is so small but I am not good with images. My previous attempt was humongous. 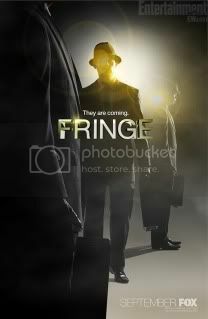 supermodel wrote: Have we all seen the first S5 promo poster, released at ComicCon? Pretty cool. Sorry it is so small but I am not good with images. My previous attempt was humongous. Looks good to me! Thanks supermodel. Well, it seems we are going to have our focus on "The Observers" as we end with season 5. Love the neat light shinning over their heads. I was just coming to post this! Thanks Supermodel! I love it too! It has a neat perception and position concept to it! It's one of my favorite posters I have seen for the series! Also the light is very yellow. A yellow universe? supermodel wrote: Also the light is very yellow. A yellow universe? Although I slightly disagree with it, the showrunners and the fans reffer to the season 4 timeline as the amber timeline or amber (yellow) universe...so "Letters of Transit" seemingly takes place in the future of that universe. So the poster could suggest the confrontation and continuation of dealing with the Observer-occupied future. Additionally as Olivia tells the child Observer she doesn't eat YELLOW M&M's because it reminds her of medicine. We could attribute "medicine" to cortexiphan which allows one to tap into energy and become kinetic with it. Additionally it is Jones' light box (filled with light dots) that trigger Olivia's abilities in the season 1-3 timeline. Question: How is it, as an actor, to finally know, for the first time, where your character is heading? ANNA TORV: It is the first time. We’re also going into the fifth season knowing this is our last, and that’s exciting too. It’s a really luxurious position that we’re in, and I don’t think anybody is going to squander that. How are you mentally preparing for when you go back to shooting? TORV: We start next week, and I think my focus is just going to be doing the best job that I can, to finish the game well and end strong. I’m not thinking about goodbye. It’s the journey that you want to focus on. The end is the reward. It’s the journey you want to make count. I know this is the end, but we haven’t even started shooting this season, so I’m still in motion. I’m not reflective yet. Are you ready to say goodbye to Fringe? JOSHUA JACKSON: Yes, I’m ready because the opportunity we have to properly finish our show is maybe the rarest thing that can happen, in the television world. The last two years, there has been a contingency plan to end the show, and we could have put a reasonably satisfying ending to any one of those seasons, but you still would have had to jam the ending in. Now, we have 13 hours to tell a whole ending to this story, and I couldn’t be more excited about that. It’s a gift for us, who make it, and it’s a gift for the fans, hopefully, if we don’t screw it up. It’s the nice version of the story. It’s the non-Firefly, non-Millennium version of the story, where everybody who has put in the time gets the chance to walk away. Not everybody is going to like the ending because it’s an ending, and that’s the way endings are, but everybody who has put in the time is going to have the opportunity to go with it through its entire life cycle. It’s just the opportunity for us to properly say goodbye to the people who have come on the journey with us. That’s just beautiful. What are you looking forward to, in this final season? TORV: Being able to put all of my heart into Olivia. It’s the first time, in a couple of years, that I’ve just had her to play with. What science fiction topics are you excited to tackle, given everything that has already been covered? JACKSON: The colonization idea is something we haven’t done. I think the humans as rebels is something that’s new to us. What’s most important to me is the emotional core of the show. It is what has carried us through all those left turns, alternate universes and alternate characters. What I’m most interested in tackling, at the end, is the final chapter of these characters’ story, and figuring out what the emotional dynamic is and where we want to leave it. We get to choose now where all of those characters finish. Anna, how was it saying goodbye to Fauxlivia? TORV: That was hard, tough and sad. I loved the alternate universe and Fauxlivia. We’ve said goodbye, but I’m still hoping she will pop back, in some incarnation. But, I don’t know. Do you think it’s possible for Olivia to have a happy ending? TORV: That’s what I’m going to think about and work on. At the moment, no, I don’t. I’ve said that a lot to the guys. Some people just aren’t meant to be happy. Sometimes they are just loners, and I have a feeling Olivia is just that. In saying that, I am an advocate for Olivia and Peter. Olivia is a loner, and I wonder if she needs to go to that extreme and come back. I think that’s this season, for her. Assuming you know what the direction will be for this season and where it will end, are you satisfied with what it could be, and do you think the audience will be satisfied? JACKSON: Am I satisfied? Yes. Do I think the audience, as one monolithic block, will be satisfied? No. That’s never the case. Not everybody will be satisfied, and I actually think that’s good. Part of the beauty of a long-format story is that the characters become as much yours as they are mine, and you dream of them in a different way than I do. So, when we do get to an end, we are making a choice. I’m hoping that not all the characters die, so there’s a possibility that, even though the cameras stop rolling, those characters live on. There will be some hard feelings, I’m sure, at the end, but I’m still happy that we get to tell our end, for better or for worse. If you could create the ending for the show, how would it end? TORV: That’s something I’ll answer after. I don’t want to say because I don’t want to allude to what’s happening. This is the first time we know what we’re doing for this season, so therefore I don’t want to be imagining things that I want. I want to be totally committed to what we are doing. What is Fringe’s greatest accomplishment? JACKSON: [Fringe] is not unique in this because I think all good science fiction can accomplish this, particularly in the television format, but its greatest accomplishment is having human characters at the center of a huge, epic story, really having a believable heroine, and this beautiful father-son dynamic that is a very rare thing to put into a story. John [Noble, who plays Walter Bishop] created this beautiful, human, broken, tortured, funny, witty, scary character that is totally unique and instantly relatable, which is the hardest thing in the world to do. Maybe that’s our greatest accomplishment: John Noble.